Nuno Henriques aka Lama was born in 1975 in Lisbon – Portugal. 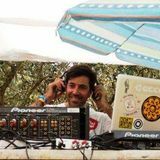 He has started his career as an engineer/dj/sound Designer and producer early in 1998 as being one of the pioneers of Trance Music in Portugal introducing later in his dj sets a mix of music styles such as Psy- Trance, Techno, Progressive and Deep House. Currently his music references.Lama interrupted his music career for a few years to his former “standard” job but since 2010 he returned strong, by creating music on his own as an outlet for his creativity. Now with over a decade of producing and sound engineering experience he became well known for his technical ability. But that’s only half of the story; His musical talent also flourished with recent productions receiving widespread support from other Dj’s and Clubbers alike.